As the snow-capped dome of Mount Shasta took California with it into my rear view mirror, I wondered fleetingly whether we were leaving the best of the Pacific coastal strip behind. What did Oregon, and Washington State have to offer? 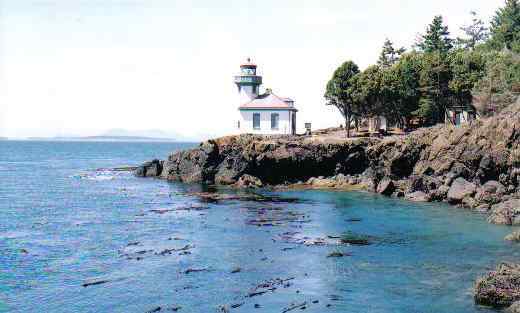 Aside from ‘Sleepless in Seattle’, this coastline and its interior were blanks on my mental map of the USA. My girlfriend and I left the endless I-5 and took the road west to the Pacific shoreline, which we reached at Bandon. Looking northwards, huge sea stacks studded the shoreline, interspersed by endless, empty sandy beaches. It was a promising start. After a long day’s driving, we pulled into Newport, a sprawling town at the mouth of Yaquina Bay. The three storey, blue boarded Sylvia Beach Hotel reminded me of the McCloud Hotel in California (see T/T #29) in that it had it’s own clear identity. Here, the emphasis was on the world of literature, and every room was named after a famous writer. It was uncanny that we should get the Tennessee Williams room, since of the three books I had brought with me, one was a collection of plays by the very man. Photographs, quotes and posters of film adaptations adorned the walls. We went to sleep with the warm breeze riffling through the open windows and the regular boom of surf pounding in the background. Never mind the tsunami warning procedures on the door. Perhaps the real reason sleep came more easily than usual was the sampling of various beers at the Rogue Ales Brew House. Opened in 1989, they serve up a wide range of Oregon brewed ales from Pale Ales to Porters. The Juniper Pale Ale slipped down a treat, with a dry, spicy aftertaste. By now, the food and drink had certainly relaxed us, and we meandered up the remaining coast, taking in a trail at Ecola State Park that led through dappled wooded bluffs and to a beach strewn with bleached driftwood from winter storms. The sun was glinting through the tree line west when we finally entered Portland that evening. The next day saw us strolling around the city. The general ambience was airy, affluent and lively. The Art Museum hosted an interesting exhibit of lantern slide prints from Tibet and Mongolia in the 1920s, as well as European art, though the Impressionists were off-limits due to renovation work. We picked up some deli sandwiches at the Great Harvest Bread Company, and made our way out of the city to Washington Park by the Metropolitan Area Express (MAX) light railway and then committed an illegal act by furtively consuming them in the Japanese Garden. 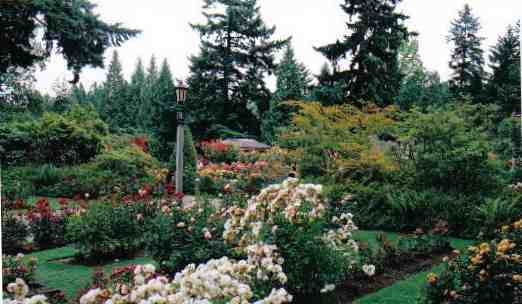 Located in Washington Park, this was a fairly small, though extremely peaceful collection of exotic plants and zen layouts. Not far away was the International Test Rose Garden, featuring thousands of tester plants, conveying a wonderful profusion of scents and colour. Portland couldn’t detain us for long, and soon we were heading north once more, aiming for the huge hulk of land jutting out into the Pacific known as the Olympic peninsula. Thousands of square kilometres of glaciated peaks and temperate rainforest shroud the centre and west of this area, whilst the eastern side, on Puget Sound is relatively dry. As we drove west, hills cloaked in forest loomed, and tatters of cloud drifted across their slopes. The Hoh rainforest is one of very few areas of conifer dominated temperate rainforest in the world. Club mosses hung in curtains from a forest monopolized by a consortium of Sitka spruce, western hemlock and douglas fir, many specimens over 200 metres tall. A dense under storey of shrubs, herbaceous flowers and ferns created a morass of greenery. With 142 inches average rainfall, it was no surprise to catch an afternoon shower as we strolled the 1.2 mile Spruce trail from a well-equipped visitor centre. A reddish-brown squirrel skittered up a tree, while damp-looking slugs glistened on the paths. Across Puget Sound rose the skyline of Seattle. First impressions jarred sharply with those from Portland, as Seattle’s downtown had a gritty, seamy feel in parts, with a large number of vagrants and homeless people. The centre was more pristine and the Experience Music Project was a delight. In addition to expositions of Bob Dylan and Jimi Hendrix, there was also a section detailing the evolution of Pacific North West music. The highlight for many (excepting those of us with no musical ability whatsoever), would be the sound lab with the opportunity to lock yourself in a booth and create your own tunes. Another highlight was the Underground Tour, a 90-minute experience under the streets of the city, viewing old passageways and rooms that were once at street level but have long since been built over. Guides explain the history of Seattle, and the original, ill-fated attempts to create the city. A two-hour drive north was Anacortes, our embarkation point for a trip to the San Juan islands. Of the three major ferry stops - Lopez, Orca and San Juan itself, we selected the last on account of the possibility of seeing killer whales off its western side. On the island, we hired bicycles and cycled off. Not as mundane as you might think, considering I hadn’t been on one since failing my cycling proficiency 20 years previously. Nine miles later, after pedalling out along quiet lanes to reach Lime Kiln Point, I felt I could tackle the Tour de France. The Orcas didn’t oblige, having passed by some hours earlier, but there was an invigorating cycle back to catch the ferry. The next morning I struggled to do the tour de chambre. Many muscles might have been in shock but there was no respite for them as the next stop was Mount Rainier, inland from Seattle, and part of the Cascade Range stretching all the way through Oregon and Washington State. The imposing snow-capped peak, at 14,000 feet, swam in and out of cloud, but luckily we weren’t going that far, and instead settled for a short hike along the grassy lower slopes, littered with boulders, until reaching an overlook with views over the lumpy Nisqually glacier and its melt waters. Heading South once more, the Washington-Oregon border was reached, but crossing it would have been no mean feat for early pioneers since the Columbia river barrels along the length of the separating gorge. 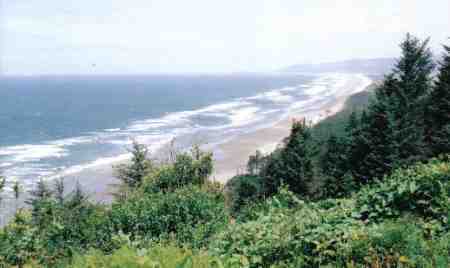 White-capped waves funnelled up the river, and giant waterfalls fell in mighty plumes on the Oregon side. From the Horsetail Falls it was possible to take a trail to Ponytail Falls, where a rocky path led underneath the thundering water. Of the others, two-tiered Multnomah was huge, but crowded, and even the smaller Wahkeena at 242 feet was difficult to fit into the camera viewfinder. Inland, Oregon become a dry and dusty sagebrush state. 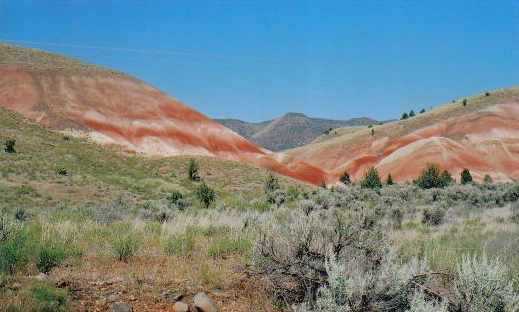 Our one foray into this wilderness was a 100-mile round trip from Bend in order to view the Painted Hills. Was it worth it? You bet. Named after John Day, an explorer who never actually went anywhere near them, these rounded hills revealed millions of years of geographic strata in astounding shades of pastel coloured clay. The ½ mile Painted Cove boardwalk allowed a close-up view of the phenomenon. Bend itself was a harmonious, gentile town, and was home to the Deschutes Pub and Brewery, another microbrew haven. Careful scrutiny of the menu revealed hops from the author's home county of Kent fused with others from global sources. Just outside of the town the Lava Lands Visitor Center and the Lava Butte, featured piles of crusty rock spewed out by an adjacent cinder cone many years ago. The High Desert Museum close by showed excellent exhibits of life gone by, and also housed a native wildlife collection, including a very skittish bobcat. 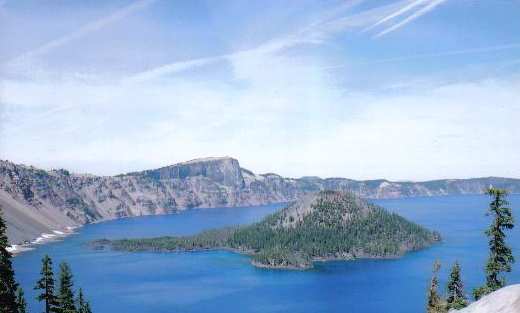 Our final port of call, just north of re-entering California, was Crater Lake. The only word to sum up this unearthly lake is blue. Turquoise water filled a caldera that required a 33-mile drive to circumnavigate. The lake itself is the 5th deepest in the world, and to reach its shores required a mile long descent through green pines along the Cleetwood Cove Trail. In most other places around the shore the rock walls fell sheer into the water. 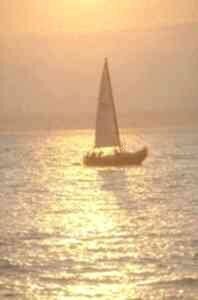 What secrets lay in the hidden depths I wondered? At least we had resolved the question of what Oregon and Washington State had to offer - a lot. See also our article on the Oregon Caves National Monument. A site with numerous links to other sites covering the area. Help in planning a trip or vacation with useful links. If you enjoyed reading the above article then you will probably also enjoy Andalucia by Graeme Down, and Charleston, also in North America, and our latest articles covering the Orinoco Delta, La Mata, Marbella and Beijing.